About a month ago, we launched our very first smartphone app called SpeckSensor! We are excited to work together with you to understand and take control of the air we breathe every day. The SpeckSensor app on Google Play and the iTunes Store automatically loads the latest Air Quality Index (AQI) reading from the federal air quality monitor nearest to your location. 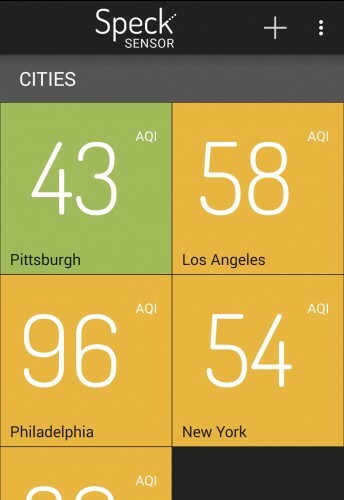 You may also add additional cities to your app to compare AQI readings in multiple locations. We hope that you will connect with us on Twitter and Facebook and use #SpeckSensor on all of your posts to become a part of the conversation. Take a screenshot of your app to show us what you are experiencing! Do you have a Speck inside your home? You can now monitor your home Speck readings from your smartphone while you are away. Simply add your Speck credentials to the app to start displaying your current Speck readings. Stay tuned for new app features coming soon. And let us know what features you would like to see on your SpeckSensor app!